Archival Digital Inkjet Print on Photo Rag Natural paper. Limited edition of 7 sets of 7 prints signed and numbered by the artist. The Prints Square comes from the series called Split Shapes. 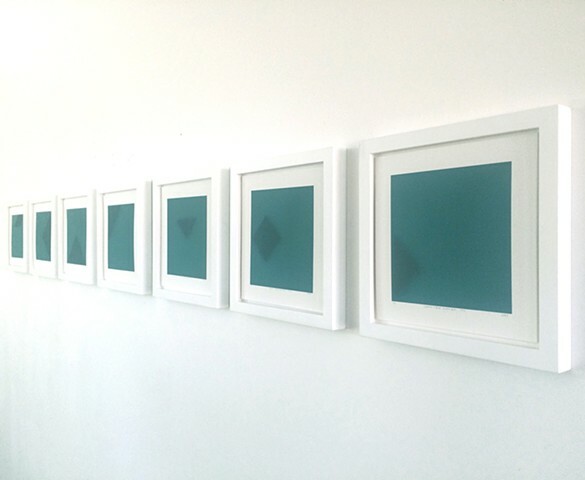 In this series, I reflect on the idea of being part of something at some point and by certain eventualities have been separated in different individual fragments, creating a kind of puzzle where each individual fragment retains the potential to fit with the other parts even if the separation is permanent. Square is also inspired by the geometric Chinese puzzle Tangram, which consists of a square shape separate in seven individual shapes. In this case each print is one of seven shapes, making a set of 7 prints, printed in a limited edition of 7 sets, each in seven different colors. The digital prints were made by scanning an assembling three dimensional black shapes with different colored translucent paper. The Prints are made on Archival digital inkjet print on photo rag natural paper. Each print is signed and numbered by the artist.